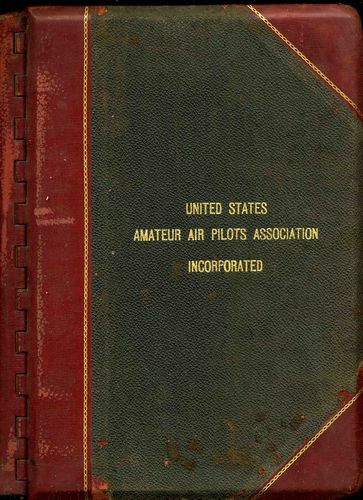 Original Archive of 103 documents on the founding of the United States Amateur Air Pilots Association Incorporated and The Sportsman Pilot Association of America, Inc. nicely bound in a heavy duty binder. The binder itself is bound in three quarter leather with pebble grained cloth gilt stamped with the title of the organization. Binder light wear with contents in excellent condition. 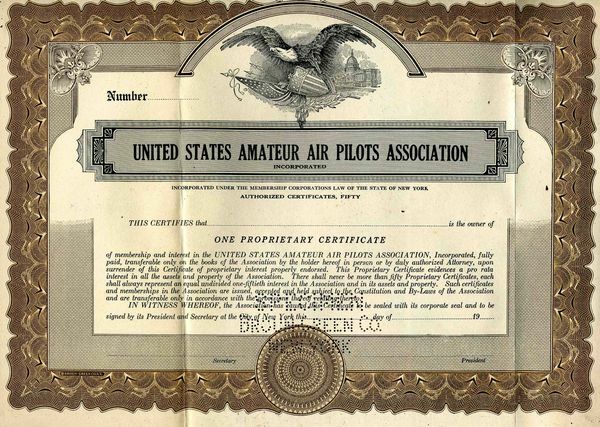 The United States Amateur Air Pilots Association was incorporated in December 1930 became the Sportsman Pilot Association of America in December 1933. Certificate No. 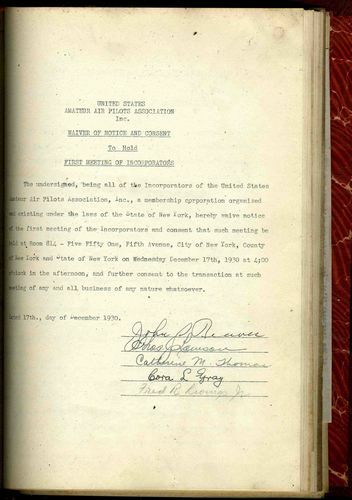 3856 Certificate of Incorporation entitled United States Amateur Air Pilots Association, Inc. Dated 17 DEC 1930 and filed in the State and County of New York. 1 page with the state of New York embossed seal followed by 4 pages of photostats of the filed incorporation. 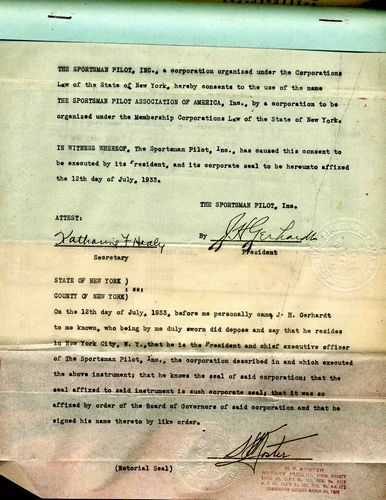 Specimen Stock Certificate for One Proprietary Share. First use of the name The Sportsman Pilot Association of America. Signed by J.H. Gerhardt and Katharine F. Healy. Building lease agreement by The Sportsman Pilot Association of America, Inc. for "Half of Room 712" in the Fred F. French Building. 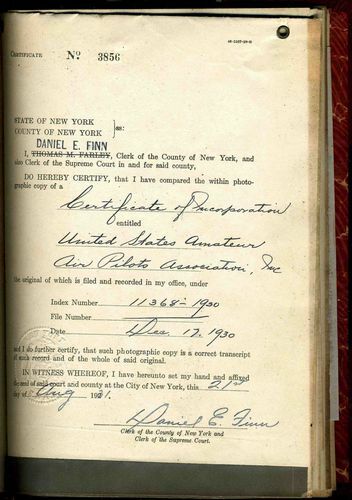 Signed December 1933. 1 pg. Typed Letter to John S. Reaves, Esq. and dated 6 OCT 1930. From Frank S. Sharp, Division of Corporations. Signed by Sharp. 1pg. Typed Document. Inspectors' Certificate. A Report of Votes for Directors. Signed and Notarized. 1pg. Typed Document. Inspectors' Oath. Signed and Notarized. 2pg. Typed Document. Subcription for Proprietary Certificate. Signed by Lawson, Thomas, Gray, Levings, and Reaves. 11pg. Typed Document. Constitution and By-Laws. Signed by Reaves, Lawson, Gray, Levings, and Thomas. 1pg. Typed Document. Waiver of Notice and Consent to Hold First Directors Meeting. Signed by Reaves, Lawson, Thomas, Levings, and Gray. 5pg. Typed Document. Minutes of First Meeting of Directors. 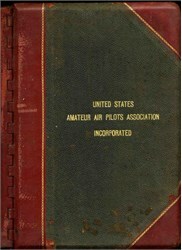 Embossed with seal of United States Air Pilots Association, Inc. and signed by Lawson. 1pg. Printed Proprietary Certificate. Folded, Unused and marked "Specimen"
1pg. Typed Letter. 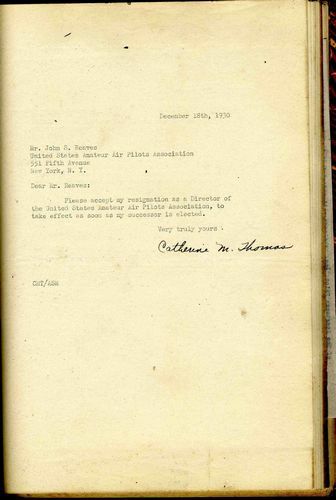 Resignation of Catherine M. Thomas as Director. Signed. 1pg. Typed Letter. Resignation of Fred R Levings, Jr. as Director. Signed. 1pg. Typed Letter. Resignation of Cora Gray as Director. Signed. 1pg. Typed Document. Waiver of Notice and Consent to Hold First Meeting of Executive Committee. Signed by Reaves, Lawson, and Henry L. Felt. 2pg. Typed Document. Minutes of First Meeting of Executive Committee. Signed by Lawson. 1pg. Typed Document. Waiver of Notice and Consent to Hold Special Meeting of Directors. Signed by Reaves, Lawson, and Felt. 1pg. Typed Document. Special Meeting of Directors. Signed by Lawson. 2pg. Typed Document. Special Meeting of Directors. Signed by Lawson. 1pg. Printed Document. Resolution of Corporation. 3pg. Typed Document. Annual Meeting of Proprietary Members. Signed by Lawson, Reaves, Harry Woodruff, Thomas, and Felt. 1pg. Typed Document. Waiver of Notice and Consent to Hold Meeting of Directors. Signed by Reaves, Lawson, Woodruff, Thomas, and Felt. 2pg. Typed Document. Minutes of Meeting of Directors. Signed by Lawson. 1pg. Typed Document. Waiver of Notice and Consent to Hold Special Meeting of Executive Committee. Signed by Reaves, Lawson, and Felt. 2pg. Typed Document. Minutes of a Special Meeting of Executive Committee. Signed by Lawson. 2pg. Typed Letter. To Reaves from Barber & Baldwin, Inc. confirming the undertaking to underwrite special avaition insurance for members. Signed. 1pg. Typed Letter. To Reaves from Barber & Baldwin, Inc. Signed. Tri-Fold Brochure Avation Insurance Plan for Members United States Amateur Air Pilots Association, Inc.
1pg. Typed Document. Use of the name The Sportsman Pilot Association of America. Signed by J.H. Gerhardt and notarized. 1pg. Typed Document. Waiver of Notice and Consent to Hold First Meeting of Incorporators. Signed by Reaves, Uden, Lawson, Coupland, and Childs. 3pg. Typed Document. Minutes of First Meeting of Incorporators. Signed by Lawson, Reaves, Uden, Coupland, and Childs. 1pg. Typed Document. Inspector's Certificate. A Report of Votes for Directors. Signed by Edward Kelly and Carl Dexter. 1pg. Typed Document. Waiver of Notice and Consent to Hold First Meeting of Directors. Signed by Reaves, Uden, Lawson, Coupland, and Childs. 11pg. Typed Document. Constitution and By-Laws. Signed by Reaves, Uden, Coupland, Childs, and Lawson. 3pg. Typed Letter. 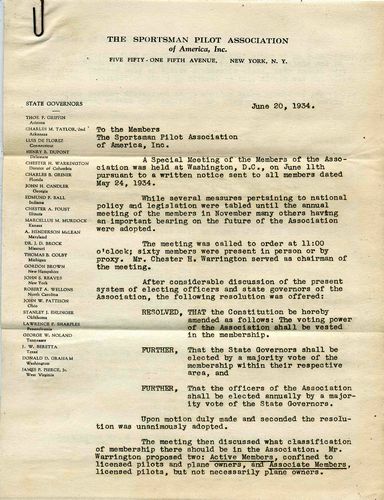 To the Members of The Sportsman Pilot Associationof America, Inc.
2pg. Printed Document. 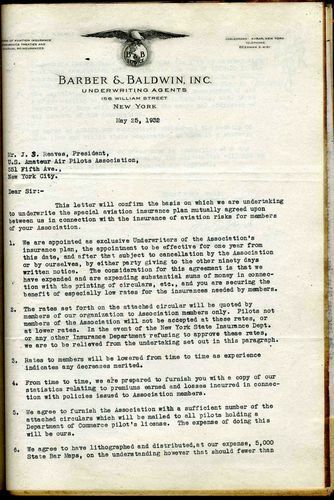 A 1933 lease agreement by The Sportsman Pilot Association of America, Inc. for "Half of Room 712" in the Fred F. French Building. Signed. 2pg. Printed Document. 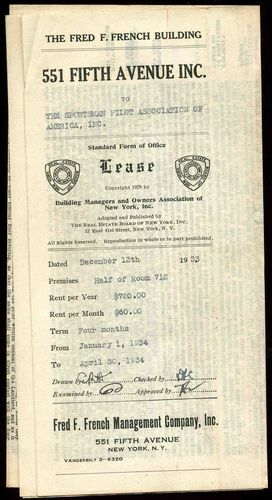 A 1934 lease agreement by The Sportsman Pilot Association of America, Inc. for "Half of Room 712" in the Fred F. French Building. Signed.